Use the Petty Cash Policy as a starting point for creating your own company policy on how employees are to be responsible for petty cash. This Petty Cash Policy is included in editable Word format that can be customized in Word or by using the included Wizard software. Company Name's policy on handling petty cash is described below. Use this page to describe your organization's policy's for using and handling petty cash (small amounts of bills and coins). Describe here how and when petty cash should be used, as well as usages that are not permitted. For example, you might say something like "The petty cash supply is maintained and used for making change during ticket sales only. Any other use must be approved in advance by the manager. List the names of individuals or the category of people (e.g., "cashiers" or "waiters") who are authorized to handle the petty cash. Describe your policy for accounting for petty cash at the beginning of a time period. For most organizations, this would be the beginning of a work shift or a business day, but it also could be every time a different employee handles the cash. Describe how and by whom the cash is acquired and counted during setup for the work period or event. Be sure to include the numbers and types of bills and coins that are required at the beginning of the period, too, as well as describing how and by whom petty cash will be resupplied after spending. Describe how records will be kept of how cash was disbursed. For example, you might say "All usages of petty cash-the amount, the recipient, the reason-must be entered in the ledger that accompanies the cash box" or "Each disbursement from the petty cash fund must be entered in the XYZ spreadsheet online. Describe who is responsible for reconciling the records of expenditures from the petty cash fund, and when this must happen. For example, you might write "At the end of each shift, the supervisor must reconcile the usage of petty cash with the remainder, write the total usage and remainder in the ledger, and sign next to the daily total. In the event that the amounts cannot be reconciled, this discrepancy must be reported to the division manager. Describe how and where the petty cash will be kept, and who has the responsibility for securing the funds when they are not in use. This might include routinely depositing funds in excess of a specific amount in a bank account, locking the funds up in a safe, etc. Describe any other important issues. These might include your policies for changing the amount of petty cash on hand, closing an account, authorizing substitute personnel on occasion, or penalties for mishandling the petty cash-any details that are part of your petty cash policy and have not been described above. 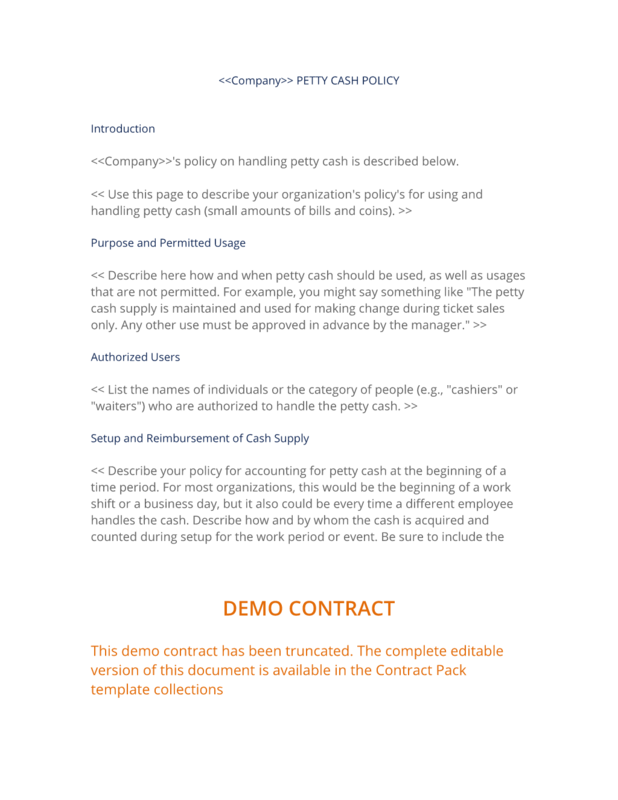 The complete Petty Cash Policy - with the actual formatting and layout - is available in this Contract Pack.